A French bank appears to be the first major company to commence a permanent switch from a legacy TLD to a new dot-brand. BNP Paribas, the fourth-largest bank in the world, is dumping its .fr and .net domains in favor of .bnpparibas for customers in its domestic market, where it serves close to eight million retail banking customers. Visitors to the .fr and .net domains are directed to a landing page that informs them that mabanque.bnpparibas (“mybank.bnpparibas”) is the company’s new domain. The new dot-brand site appears to be a fully functional online banking service, not just brochureware. It’s the ninth most-visited new gTLD domain name, with an Alexa rank today of 6,005, climbing the ranks every day. As it’s a redesigned web site, customers are able to switch back to the familiar .net site (Alexa rank: 2,543) if they wish. 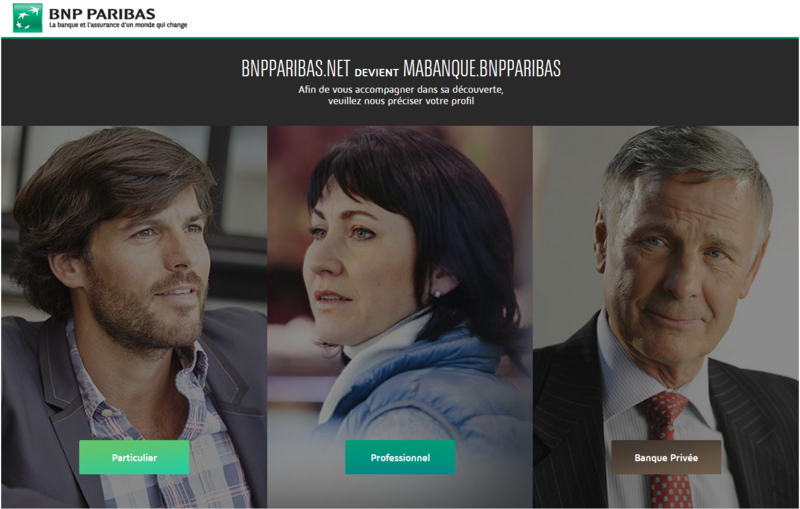 The domain was registered in January and BNP Paribas began a transition campaign in April. The transition away from the .net and .fr domains appears to have started at some point over the last month, but there hasn’t been a great deal of media coverage. The .com domain is still live, serving Anglophone customers. BIZARRE, THIS ADDRESS WITHOUT .FR OR .NET? IS IT SECURE? YES, A 100% SECURE SITE! Any address ending with .bnpparibas is managed by BNP Paribas and has an advanced security certificate. Even more reliable, this new extension now acts as a signature. Of course the architecture https and the padlock are still on your URL bar, confirming that the connection is secure. So you can browse and view your accounts in all serenity! BNP Paribas is a bit of a big deal, the fourth-largest bank in the world, managing assets of $2.5 trillion. It’s bigger than Barclays, which earlier this year said it intends to transition away from .com and .co.uk to .barclays. The .barclays and .barclaycard sites are still just brochureware, however, with no transactional features. Other dot-brands have launched sites at their new gTLDs, but .bnpparibas is the first transfer of a fully transactional web site from a legacy TLD to a dot-brand I’ve seen. The Chinese conglomerate CITIC dumped its .com for .citic last September, but soon switched back. This is just the very beginning of this sort of thing. And bnpparibas may be alone out there for a while. And they themselves may opt for an even shorter “.bnpb” in round two.. But the important thing is the die has been cast. There is no getting this genie back in a bottle. For reasons of security, for authority and for shorter “more expensive version of the .com” bragging rights, every big company (and smaller ones who want to roll like the big dogs), will all eventually move to their own right of the dot name. I give it a 20 year runway tops. .com will still be the largest generic but it will absolutely become marginalised to some degree in the long run. Hopefully they are getting BNPParibas.Bank as well. Other players in the market should look at .trust – secure gated community, alongside the provision of a range of secure monitoring services for the branded domains- which only allows banks/retailers/brands to apply and use once they have achieved a high bar of security guidelines. Thus creating a safer internet environment for users and consumers alike. So they went with an even longer domain with a dot in the middle…. too fuc*in’ funny ! Frank, 20 year runway? Ouch! You and I are about the same age and we will be pushing 70 years old when the 20 year mark comes around. Meanwhile, I can make a whole lot more money investing in other investments or .com in the short term. From the way you put it Frank it sounds like it’s either a pipe dream or decades before I will see a return. And, will I see a return with these domain acquisition and renewal prices stacking up for 20 long years before I see the light? It’s going to eat up the ROI in a big way if I ever see a return to begin with. That’s just playing poker against the house if you ask me. It’s just nuts and a horrible, horrible, horrible investment compared to other alternatives. home.barclays was there first. Anyway, I would prefer that all banks and financial institutes would decide on using .bank. It is easier to stand behind one TLD to better communicate it to clients. In the US over the next years I’m certain we will see this shift. 5.000 .bank domains regged over the first two weeks, and the first bank has just announced the switch away from .com to .bank. BNP Paribas had a site up before Barclays. And the Barclays one is just brochureware. Customers still use the co.uk to bank.